Strouds, 1/5 Red 4/5 Blue - "A Parcel of Strouds, Duffields, Blankets, Silver Trinkets and other suitable Articles for that Trade." Overwhelming Prevelence of Blue Cloth in the SE Trade, 1754 - 1763. In the zeal to overcome the sea of leather, unshaven heads, and general uninformed interpretations; a great deal of effort was put into discovering a "generic" guide to a better 18th century Native American interpretation beginning in the 1990's. This brought with it great advancements, but at the same time, a loss of understanding of the differences in taste which existed between regions and even village or national identities. 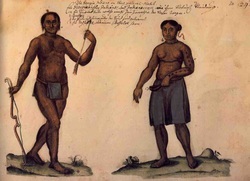 The historic record is full of references to Natives and even some Europeans being able to tell which nation an Indian belonged to – even from a distance. Looking around at living history events with a substantial “Native” presence, the eyes will be assaulted with a bewildering array of blue, red, black, and green wool matchcoats, leggings and breechclouts. While this is advancement, like the widespread use of quilled ornaments, it is just as problematic when it comes to distorting the historic truth. -The South Carolina Gazette February 23, 1760. Now, European clothing made from Stoud is not that crazy. Stroud cloth was commonly used but without the “saved list” stripes and designs found on the textiles destined for the Indian trade. What is telling is that this advertisement in the SC Gazette is asking for local industry assistance. Interestingly, the SC Gazette in this same period is littered with advertisements for storehouses with Stroud cloths for sale to Indian Traders. Buy why so much blue? We really will never know why blue wool was so popular in the 18th century Southeast; far more popular than red, black, or green. However, inventories of trade and gift lists bear this out during the 1750’s. The following are a series of excerpts from various lists which support this apparent preference for blue in the Southeast. Frock coats of cheap blue cloth (except 10 of Complet) with scarlet close cuffs and collars (without lace). ½ yellow and ½ white buttons – not scanty. As the historic record indicates, blue wool was a definite favorite among the Indian nations of the colonial Southeast. Like checked shirts (to be covered in another article), blue wool seems to have emerged by the 1750's as an identifier of sorts for peoples such as the Cherokee, Chickasaw, and Catawba. *Special thanks to Billy Jack for the info.